Click here to view this information on the HFCC website. This entry was posted in Emergency Preparedness, News, Schedules and Frequencies, Shortwave Radio and tagged Emergency Broadcasts, Emergency Radio, HFCC, International Radio for Disaster Reduction IRDR on October 12, 2017 by Thomas. Many of us living in the eastern half of North America are bracing for a winter storm this weekend. If predictions are correct, this storm could dump a lot of snow, sleet, and freezing rain in many areas. Often when a storm is pending, people rush to the stores to buy bread, milk, and eggs. What I concern myself with is stocking up on power! And you can guess why. It’s a fact, and a fun one: some of the best shortwave/mediumwave listening conditions happen during a regional power outage. The local noise level simply dives as noisy electronics take a temporary vacation…leaving an opening for some great SWLing. SWLing Post readers: How do you prepare for potential power outages? This entry was posted in Articles, News, Preparedness, Shortwave Radio and tagged Emergency Preparedness, Emergency Radio, Preparedness, Severe Weather Preparedness on January 21, 2016 by Thomas. What to broadcast after a nuclear attack? The BBC had a plan. 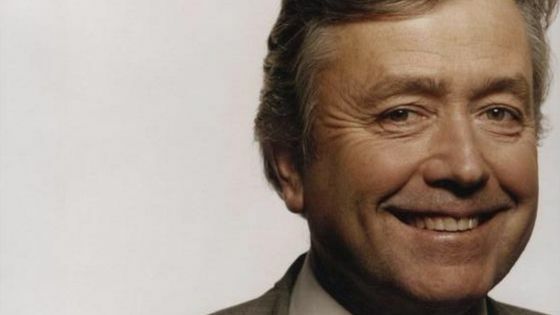 If you live in the UK and listen to the radio, you’ve probably heard that long-time announcer/broadcaster Peter Donaldson died earlier this week. For years–decades actually–Donaldson was a prominent voice on Radio 4. Donaldson was also well-loved by his listeners, and his colleagues at the BBC (read this touching tribute). Donaldson had a familiar, calming voice; perhaps that’s why he was asked by the BBC to record a series of informational messages in the event of a nuclear war. Yes, to be clear, the BBC had a plan. “BBC newsreader Peter Donaldson, who has died aged 70, was to have been the voice of radio bulletins in the event of a nuclear attack. What would have gone out on the UK’s airwaves if the Cold War had turned hot? While I’m an avid radio listener, I should hope I never hear a similar message over the air (even though Donaldson’s voice is indeed quite calming). Remember there is nothing to be gained by trying to get away. By leaving your homes you could be exposing yourselves to greater danger. If you leave, you may find yourself without food, without water, without accommodation and without protection. Radioactive fall-out, which follows a nuclear explosion, is many times more dangerous if you are directly exposed to it in the open. Roofs and walls offer substantial protection. The safest place is indoors. Make your food stocks last: ration your supply, because it may have to last for fourteen days or more. If you have fresh food in the house, use this first to avoid wasting it: food in tins will keep. Water must be rationed, and used only for essential drinking and cooking purposes. It must not be used for flushing lavatories. Ration your food supply: it may have to last for fourteen days or more. PRI’s The World featured a story about Peter Donaldson as well, and it was mentioned that perhaps the US has a similar “official” post-attack statement. I’m willing to bet we do, but I’m not sure how it would be disseminated over radio. Unlike the UK, we don’t have local relays of a government broadcaster. We do have the Emergency Alert Service which is directly tied to local and national broadcasting outlets–assuming satellite feeds are still functioning, that is. This entry was posted in Articles, Broadcasters, Emergency Preparedness, News and tagged Emergency Broadcast Service, Emergency Radio, nuclear attack statement, Peter Donaldson, post attack statement, Why Shortwave Radio on November 5, 2015 by Thomas. 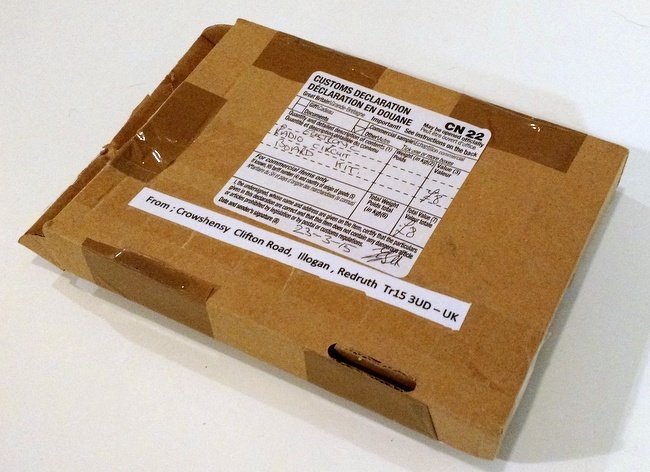 A few weeks ago, we published a short post about a credit card crystal radio from an eBay seller in the UK. I purchased a kit–at $17-18 US shipped, it’s quite a modest investment for what might be a fun little project. The crystal radio arrived while I was traveling during Easter break, but my free time has been so (extremely) limited lately, I was only able to unpack and try out this new arrival yesterday. The biggest surprise for me was the fact that this isn’t really a kit–the board is fully populated and requires no soldering whatsoever. The board feels of very good quality. All that is required is connecting the high-impedance earphone, earth/ground and aerial/antenna to the board. Since all of these components can be connected with the supplied alligator clip cables, getting it on the air took all of 20 seconds. I simply hooked up the ground and connected the aerial to my sky loop wire antenna. I instantly heard a signal and station ID which confirmed it was our closest local broadcaster on 1010 kHz. This station isn’t of the blowtorch variety, but is the strongest one I receive on the MW band simply due to its proximity. Audio was quite faint through the earpiece, but I believe if I tinkered with antenna length and the two variable capacitors, I could improve reception. SWLing Post reader, Richard Langley, received his crystal radio and had a very similar experience with reception. With any crystal radio (especially one this small), performance is directly correlated with antenna length, availability of a good ground connection and, of course, strong broadcasters in your vicinity. I plan to spend an evening tinkering with this little receiver and see if I can pick up some of the night time powerhouse AM stations on the east coast. I can say this: if you’re looking for a simple, uber-compact emergency receiver for your go-bag, bug out bag or emergency kit, this one will certainly fit the bill. This crystal receiver and all of its components weight no more than a few ounces and could easily fit in compact pouch or sleeve. 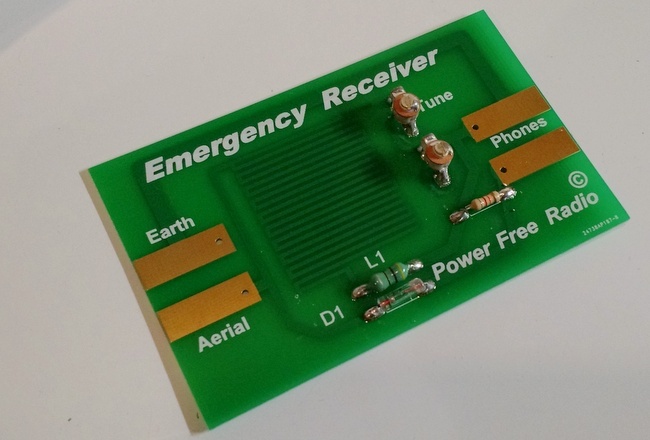 Have any other readers have enjoyed tinkering with this little emergency crystal radio? If you would like to purchase one, try searching eBay with one of the links below. The product will only appear in the search results if currently available. 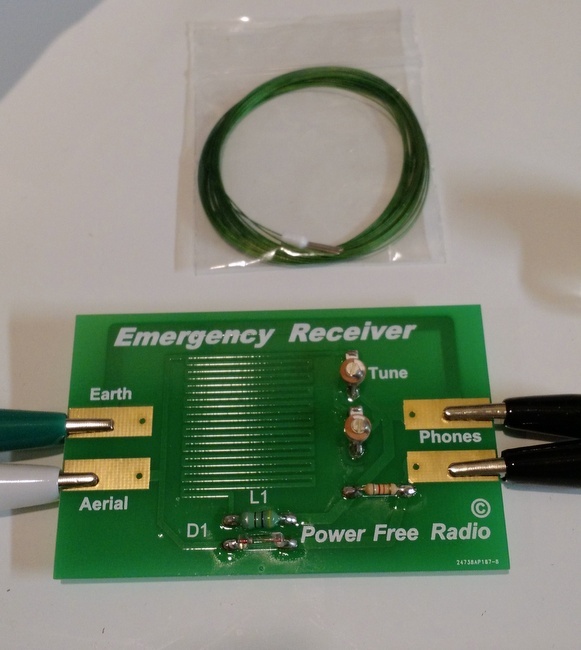 This entry was posted in AM, How To, Kits, Mediumwave, News, Radios, Reviews and tagged BOB Radios, Bug Out Bag Radios, Crystal Radio, Crystal Radio Credit Card Receiver, Crystal Radio Kit, Emergency Radio, Medium Wave on April 14, 2015 by Thomas.